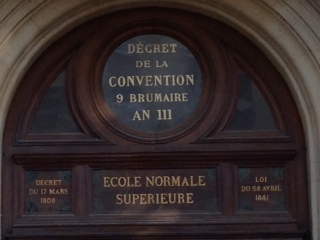 For as long as I can remember, I have had a fascination with the École Normale Supérieure. So many French philosophers I have read about have studied there. Sartre, Foucault, Derrida, Hyppolite, Althusser, Beauvoir. In fact, Sartre and Beauvoir first met here in 1929, when both were studying for the agrégation, France’s toughest exam for want-to-be-philosophers. Throughout the twentieth century, this most elite of Paris’s educational institutions has been a breeding ground for new bold new ideas, a hotbed of -isms, including existentialism, humanism, structuralism, post-structuralism, deconstructionism and more recently, postmodernism. Naturally, when I was in recently in Paris doing research on the lives of French philosophers for my book Lovers of Philosophy, I wanted to visit the place where so many prominent continental philosophers developed their initial ideas. So, along with my 14-year-old daughter Alex who was travelling with me, I found myself cycling through the Latin Quarter in search of this esteemed institution. It’s usually more fun looking for places that are off the tourist track when travelling, and this journey was no exception. Before long, we found ourselves on the Rue d’Ulm, a narrow tree-lined backstreet with cheap and battered bicycles chained up along the railings of its wide pavements, a clear sign we were close to a place frequented by poor and struggling scholars. Sure enough, we soon saw increasing numbers of young people in that universal student uniform, jeans and T-shirts, walking along singly or in twos and threes, books and bags in hand. Then we came across what we were looking for, an old nondescript sandstone building with a faded sign across the top of its entrance. 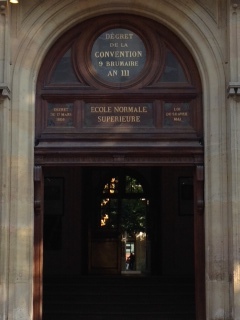 The sign said École Normale Supérieure. I had travelled 26,000 km, all the way from Brisbane on the other side of the world, to visit the place where Sartre and Beauvoir had met ninety years ago, but now I faced an unexpected obstacle. There was a boom gate and security guard at the university’s entrance, with access only allowed to authorised students and staff. 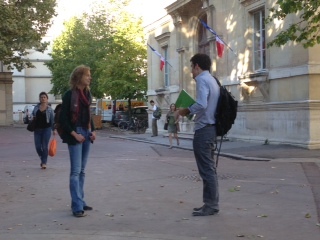 I thought about just trying to discreetly walk in as a student let himself out, but my conscientious, rule-abiding and embarrassment-averse daughter got visibly nervous when I mentioned this idea, and I had to admit I didn’t fancy the prospect of being handed over to French authorities for trespassing in a school of philosophy. ‘Sure’, he nodded, and opened the gate. Easy as that, after all. Somewhat exhilarated, we walked through the security gate and up the stone stairs into the institution’s front building. Inside we found several highly intelligent-looking impossibly young philosophers of the future going about their business. ‘Try to look like a student’, I whispered to my daughter, who was thoroughly enjoying our adventure by now. 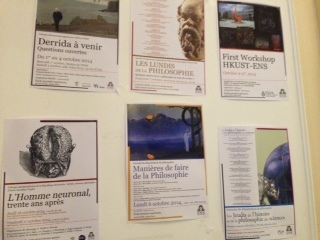 Posters of upcoming philosophical events graced the walls. One poster featuring a large full-length photo of Jacques Derrida looking wistful on a beach announced a talk that day about the recently deceased father of deconstruction. The foyer then opened up into a beautiful garden, in which students with laptops, papers and books sat here and there on park benches and tables. It was a beautiful sunny day, and a lovely light breeze rustled through the trees and shrubs in the garden as students murmured softly and earnestly to each other. I couldn’t make out whether they were talking about philosophy or their social lives, but I did notice one attractive-looking young female student looking at her paper with a middle-aged man, presumably her professor, sitting very close to her as he pointed at the unwieldy manuscript on the table before them. I instantly recognised what appeared to me to be an example of a notorious and age-old pattern in university teacher-student relations. I sat with my daughter on the edge of the garden, in a stone recess in one of the four walls that bordered the garden. Both of us tried our best, with a spectacular lack of success I suspected, to look inconspicuous. 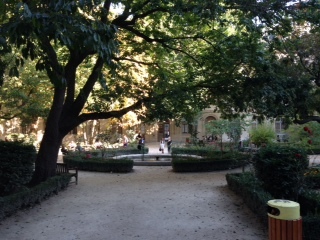 I then realised that this was probably the very garden in which Beauvoir had first met Sartre many years ago. I recalled reading an account of her visiting the École Normale Supérieure one day from the nearby Sorbonne University where she was studying, whereupon she saw a student pouring a bucket of water from a second storey window on to his fellow students below, whilst shouting ‘Thus Pissed Zarathustra!’ The twenty-one-year-old Beauvoir was most impressed with this young man’s mischievousness, not to mention his knowledge of the philosophical work Thus Spake Zarathustra by Friedrich Nietzsche, a philosopher whom she was familiar with and greatly admired. The water-pouring prankster was, of course, the future existentialist philosopher Jean-Paul Sartre. Within weeks he and Beauvoir would team up to become the most renowned philosophical couple in history. I wandered out of the garden into an exit on its far side, which led into another foyer. On one of the walls of this large sandstone room I found a large memorial board of the type that sadly one sees frequently throughout Europe. 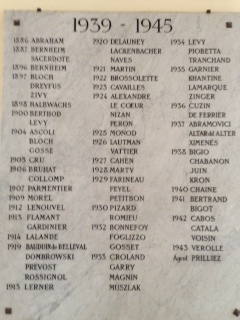 This board listed the names of previous students of the École Normale Supérieure who had perished in the Holocaust. Amongst this list I recognised the name Paul Nizan. I remembered from my reading that Nizan was one of the students whom Sartre had poured water on in that fateful prank in 1929. He was one of Sartre’s closest friends at the École, and became a close friend of Beauvoir’s, too. He, along with Beauvoir, was part of a small group of students that met regularly at Sartre’s place to discuss philosophy. It was at this group’s meetings that Sartre and Beauvoir’s relationship blossomed. It came back to me on seeing Nizan’s name on that board, that I had read how he had been detained during World War Two and transported to a concentration camp, never to be seen again. It was into this ravaged world, in which people had lost faith in institutions such as the church, the state, and even science and technology to guide them, that the existentialist philosophy of Sartre and Beauvoir, based on the idea that each of us must create our own meaning in life, would later flourish and become the philosophy de rigueur on the streets of post-war Paris. Enter your email address to follow Lovers of Philosophy and receive notifications of new posts by email.